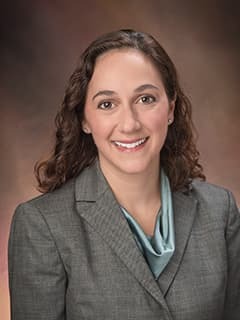 Alyssa R. Rosen, MD, is a pediatric neurologist in the Division of Neurology at CHOP, specializing in the care of children with autism and epilepsy-related disorders. Kessler SK, Minhas P, Woods AJ, Rosen A, Gorman C, Bikson M. Dosage considerations for transcranial direct current stimulation in children: a computational modeling study. PLoS One. 2013 Sep 27;8(9):e76112. Rosen, AR. “How Should Vertigo be Evaluated and Treated?”. In D. Licht & N. Ryan (Eds.) Curbside Consultation in Pediatric Neurology: 49 clinical questions (Chapter 40). SLACK Inc. (in press). A. R. Rosen, S. Kessler, C. Ackhar, A. Poduri, E. Sherr, for the SVIP Consortium. (2013) Seizures and Epilepsy in 16p11.2 Deletions and Duplications. Poster presented at the American Epilepsy Society Annual Meeting. Washington, D.C.